In May 2016 Aspire Launched 3 Distribution & Support centres right here in the UK. Each Distribution hub and support centre is responsible for servicing the whole of the UK. We work together as a team to insure stock fluidity and service is of the highest calibre. In addition to this please find a copy of our certificate of Aspire representation signed by the CEO & General manager of Aspire HQ. We service hundreds of UK vendors with Aspire Hardware each and every week. We not only provide rapid stock delivery but also support any issues that arise once the units have been sold on in the UK market. By purchasing your Aspire products from us you are getting a fantastic wholesale price that is cheaper than importing from China. In addition to this by purchasing from us you are effectively buying direct from the Aspire factory so you are covered knowing all products are genuine, electricals come with a 6 month warranty and returns are dealt with in the UK. So why have Aspire done this ? TPD regulation came into force in the UK on the 20th of May 2016. 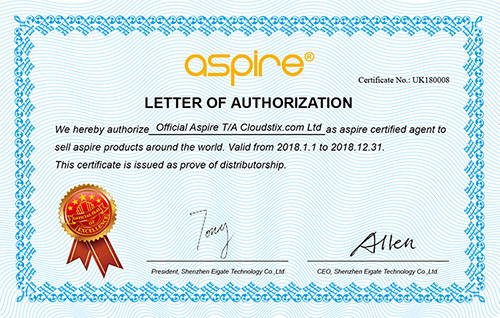 Aspire wanted to have an official distribution team in place to take on the burden of product notification, testing & submissions for their products within the EU. Our distribution team will be responsible for this and so if you are dealing directly with our team you do not have to worry about the TPD when selling Aspire TPD compliant products. If you are a Vendor based in the UK we are taking all of the hassle and stress away caused by the paperwork and notification required for importing Aspire Products. If you purchase from our team you never have to worry about TPD issues on Aspire hardware. One of the biggest issues we have helped Aspire overcome is the brand destroying low values at which some UK Wholesalers were selling Aspire Hardware for. This created a price war were everyone seemed to be able to sell cheaper than somebody else no matter the size of their company or their Aspire Spend levels. In July 2018 when global manufacturing costs increased and the price of purchasing from China increased Aspire introduced it's new wholesale system across all global distributors. This brought fair margins for everyone whom bought into the system and an end to the price war which threatened the brand. Official Aspire are responsible for servicing this system to the UK at the cheapest prices possible. When comparing our costs to importing from Elego, Heaven's Gift then its a no brainer whom will get you the best price and a next day UK service. Official Aspire UK will work with you to better service your customer in the form of product support which can solve any issue quickly in your store to avoid your customer getting upset and cut down the number of returns on your products. In addition, this provides a boost to repeat business which is critical in the UK vape scene today. When buying direct from us you will get a 6 month warranty on all Aspire electricals such as mods etc. if a problem does arise with your order you will have a dedicated customer support centre in your region that you can speak with Monday - Friday during normal business hours. In addition to this you will have a support email that shall be monitored until 10pm each night giving you access to Aspire support at any given time. Terms and conditions apply to the extended warranty. The Aspire UK Distribution team is run by Directors of vape stores so we know what you face from your customers on a daily basis. We have the knowledge and experience to help you better your own customer service. That is not to say we are here to run your business, far from it, your business is your own and yours to run as you see fit but with our team behind you we hope to help you grow as the electronic cigarette enters a new era under TPD regulation / post Brexit. By choosing to buy from OfficialAspire.co.uk you are effectively gaining a UK based support team right at your fingertips. So as you can see the UK market is serviced very well by Aspire and we hope that all UK vendors will now use this service and propel your business forward in the coming years. If you have any questions regarding the UK Distribution team, the TPD, our support service or our products please feel free to contact us.